Imagine if you will, the benefit to your business of having, not just one, but a team of fully trained, friendly and passionate receptionests answering your business phone in your company’s name, while at the same time, taking messages and sending them to you real-time via email and SMS, and ensuring you never miss a beat. In addition, they will also recieve all your vistors, book meeting rooms, receive and sort post and deliveries on a daily basis. Whether you are a virtual office or a serviced office client, our fully trained reception staff will take care of your call answering needs every step of the way. Your company gets a Dedicated Company Number (DCN) which is your unique telephone number. This number then gets programmed into our switchboard/PABX with the name you want your company answered as. Everytime this number is dialled, it rings at our reception desk, and our team of reception staff in your centre then answer the call in your company’s name. All calls are either put through to your office, or if you are out of the centre (or a virtual client), then we send you a message as an Email and SMS, which ensures you are always on top of getting and returning all calls. In addition, our dedicated reception services enables our tenants to book meeting rooms easily throughout the day. Clients are notified of any parcels and mail that arrives and all ICT call outs and maintenance issues may be logged through reception services. When our clients have guests, we welcome them and announce their arrival to your business. 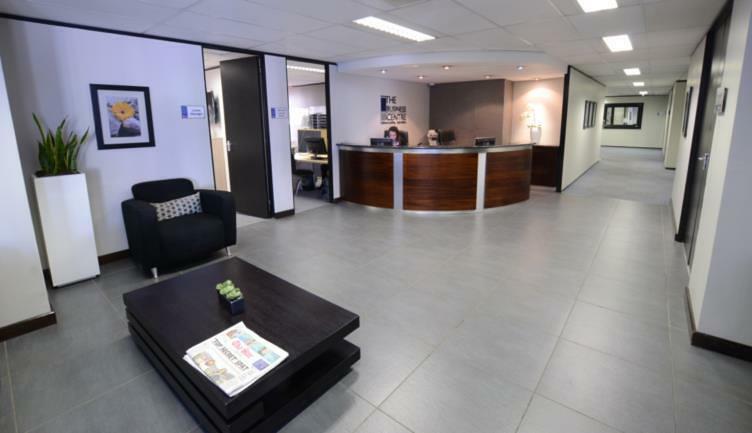 Guests can enjoy watching DSTV in waiting areas on comfortable couches, or simply keep up to date with news from a wide selection of local newspapers. Reception areas include a digital logo wall that showcases all clients’ logos, and acts as a great marketing platform.